I’ve had a pacemaker for over two months. My family life seems to be back to normal. I’ve had to visit my cardiologist a couple of times so he can see how I’m doing since the installation of my “bionic” part. I’m amazed with the pacemaker technology. Basically, the pacemaker is a supercomputer. It holds in its memory everything that my heart does. If I feel my heart is beating faster than normal or harder than normal, or if I lose my breath at times, I simply write down the time and date of the incident. Then I report the incidents to my cardiologist. 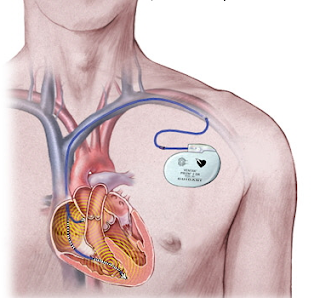 My doctor can then make the needed adjustments to the pacemaker via his remote device. I probably shouldn’t be giving this information out so freely. If my arch nemesis gets a hold of this knowledge, he could build his own remote device to control my heart rate, and consequently make me do whatever he wants me to do. Worse, my wife could get a hold of that remote and speed up my heart to make me complete her “honey-do” lists at miraculous speeds. Then she could give me even longer “honey-do” lists. This pacemaker, you might say, is my Kryptonite. Drat! I finally saw the pictures my friends and family took of me while I was in the hospital getting the pacemaker. I don’t know what I anticipated. I knew the images of me weren’t going to look good; I was sedated and I did not shave or shower for days during that hospital visit. Yet I wanted to see what I looked like, kind of like when you get off a roller coaster at a theme park and you want to see the picture the park took of you just before going down that really big hill. After seeing the picture, you wanna give money to the guy selling the pictures just so he’ll destroy the negatives because the pictures are just as bad as you thought they'd be, and you don’t want any record of them. I paid off friends and family to destroy their hospital pictures of me. I didn't want any record of them. But I’ve had some fun with my pacemaker. People ask how long the battery lasts, which is a good question because people are very curious about battery life these days with the advent of devices like the new iPhone. (The iPhone, as you may or may not know, is a phone, music and video device, calendar and address book that seems to require either a really long-lasting battery or a lot of plug-in time.) Cell phone batteries might last a day if you use it often. Laptop computer batteries last about five hours. How long can a pacemaker battery possibly last? “How do you know if the battery is dead?” the inquiring individual asks. Sounds silly, but I’ve fooled many inquiring individuals with that line of answers. In reality, my battery will last me about 10 years. Then the doctor has to go back in and replace it. The pacemaker only turns on about 6 to 20 percent of the time in a given week. Nevertheless, that’s still a long battery life. Now, if only I can get one of these pacemaker batteries for my laptop computer or my cell phone. Maybe the makers of iPhone could adapt the pacemaker battery into their technologies. But if it costs as much as my pacemaker, nobody will be able to afford the iPhone.